I'm really looking forward to the Facebook Communities Summit coming up in February. 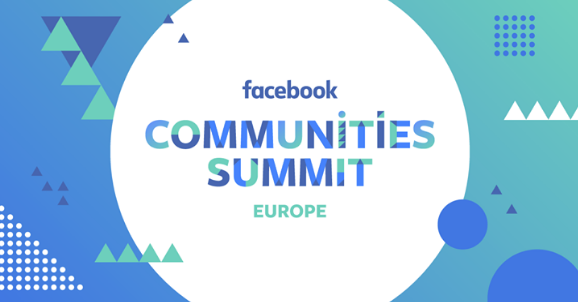 Attend the summit by RSVPing on the Facebook Communities Summit Event Page. The live summit will stream directly to that event page on Friday, February 9 at 10:20am GMT. You bet I'll be putting on my big girl pants and getting up to watch it! The opening keynote is from Chris Cox, Chief Product Officer at Facebook, and with all this change happening to Facebook within the past week, this is an event I'm not going to miss! I have personally benefitted tremendously from Facebook groups and I know that in the wake of recent changes to the Facebook Pages algorithm, building real community in Facebook groups is key to maintaining organic reach on Facebook. Many of my clients and collaborators use Facebook groups to build communities around their ideas, apps, brands, systems, educational products, and digital assets. For its members, a Facebook group becomes a place for customers to become friends with each other and receive crowdsourced feedback, tips, encouragement, and troubleshooting. Without advertisements of any kind, my personal brand's Facebook group now grows at the rate of about 20-40 members per week with the main lead funnels being various digital offerings and my YouTube channel. The average post in my group receives between 4-25 comments and as you can see, growth has been steady. Growth chart, Facebook group "We Are Ambitious Christian Women"
I expect growth to increase as I begin to invest in unique digital offerings and run promotions for this great niche of women that I personally admire and learn from. We have already created 3 sub-groups to aid with organization of the growing community, allowing us to serve them better. How did I create a growing Facebook group that truly serves people? Necessity is the mother of invention. It was the community that *I* needed. If you need help determining how to build a community around your brand, I highly recommend the book It Starts with Why and considering what's the thing YOU need that you wish you had? Thanks for reading! Are you coming to the summit? What has your experience been with Facebook groups? Drop me a comment below! I want to thank you for helping me make Ambitious Christian Women what it is today. 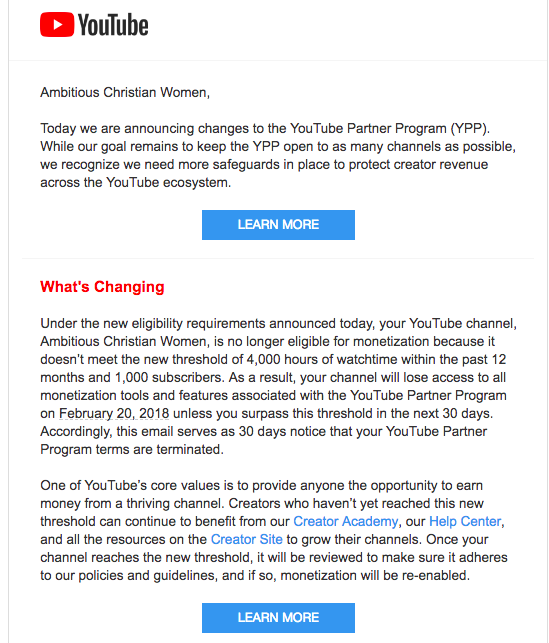 My motto is "Follow God's Signs, Not Dollar Signs" and I repeat that again before I show you this note from YouTube. Because I don't get pushed around by money (or apparent lack of money) - I trust in God and God alone for my future, my wellbeing, and my ability to impact others. - We have hosted 3 powerful online Bible Studies (one of those Bible Studies now has over 20,000 views!) and we keep getting new women signing up for these every single day. And to celebrate God's goodness and grace toward us, we are hosting a very fun giveaway within the group. I mentioned that I received a concerning letter from YouTube a couple days ago and I want to share it with you. I am sharing it as a call to prayer and also a request for us to put our minds together. 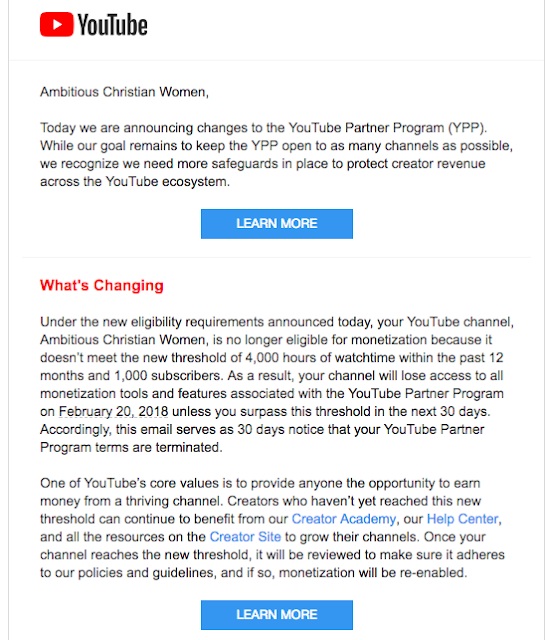 The YouTube Partner program (which I am now in danger of being removed from) was central to my strategy with Ambitious Christian Women. I did the math. Although we have over 1,000 subscribers, PRAISE GOD! I am still about 350 hours of watch time short of making the 4,000 cut. Within the next 30 days, the content on the channel must have been watched for a total of 350 hours for me to remain monetized. How much do I make through YouTube? Maybe this isn't too surprising to you... it's almost embarrassing to admit that even with countless hours of my time pouring into this, I have never received a check from YouTube (they only pay out when you hit a $100 threshold). I was so close to hitting that threshold though and I was counting on that small portion to fund giveaways like the one I'm running now to celebrate milestones, encourage engagement, and have scholarships available for women who can't afford Bible Study materials. Why does YouTube matter then? With a motto like "Follow God's Signs, Not Dollar Signs" you know I'll be moving forward regardless of whether we remain monetized. I am happy to continue to invest my own funds into its growth. Since I don't collect dues, have monthly supporters, or make any profit on running all these goodies for you, I have a very patchwork strategy right now. I am not lazy - I have tried doing raffles and asking for support and putting links to support on the free resources I create, but it hasn't gone well - unless of course $9 is impressive to you. I'm learning, and still haven't figured out the ropes of support raising and so Ambitious Christian Women, for now, exists by God's grace, my own investment, and my husband's patience with me devoting many hours a week to unpaid work. I want to stay viable on YouTube because right now, considering our rate of growth, it's my best bet. I need your help to share our videos with your friends, your sisters in christ, and family. I believe that just by doing this, we can hit the 350 hours in the next 30 days and stay a part of the partner program. Over 2017 I've created almost 100 videos, most of them recorded while I was in Guatemala for a year with my husband, working and volunteering our time with various Christian organizations. By entering the giveaway you'll be helping generate buzz in a variety of ways, and Sharing JUST ONE VIDEO counts as 3 entries. The videos include interviews with amazing female Christian authors and activists, group discussions, Bible study material, reflections on top issues, testimonies, calls to prayer, and a few very personal accounts of faith in action. This is a question I ask myself frequently, not to be a downer, but to stay on my game. For example, I have received several entries but notice that very few are taking this step of sharing a video from the channel. This is the one thing I need most. So, while asking for shares, I am also re-evaluating, paying close attention which of the videos DO get shared by our audience, while praying about how I can get better. I want to make the content more impactful and sharable so supporters feel comfortable going ahead and posting it. Even though my background is in social media, I am always a learner and always find myself getting humbled! This is a cycle that God uses to keep me growing and reaching. The internet is so full of rotten stuff, I've made it my business to be a light and there's no time to waste! Thank you so much for your love, prayer, and your support. Its an honor to create Ambitious Christian Women WITH and FOR you. Regardless of the outcome of this YouTube Partner Program, you will keep seeing me declaring Jesus and trying to make the Earth look more like Heaven. I have never been without guidance and encouragement, thanks to the Holy Spirit, and the amazing women that God has gathered around me. I shared this email with the awesome volunteer leadership team of Ambitious Christian Women and some of us will be praying and fasting, seeking the heart of Jesus for the future of the group. These women pour their time, energy, and resources into discipling our members. To learn more about them and the story of how this online ministry came to be, please visit our main facebook page and click "OUR STORY" on the righthand side bar. I could never do this alone, and I am NOT alone!